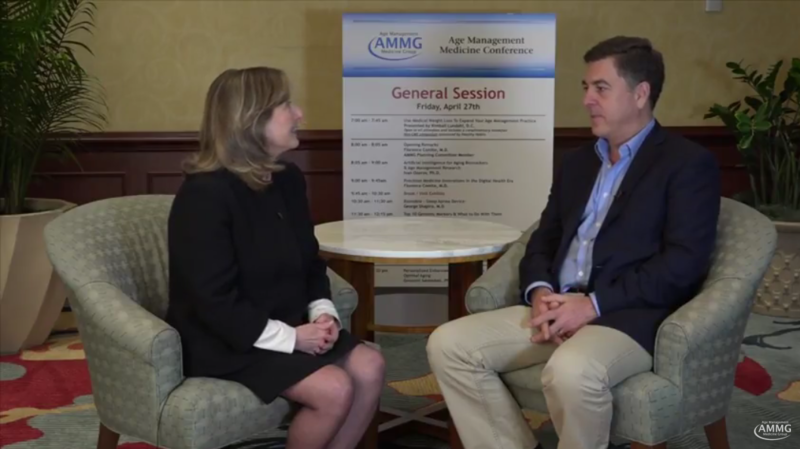 In this conversation with Florence Comite, M.D., Drew DeMann, D.C., CCSP, MA, FNP, RMSK, GCSRT, Director, Board Certified Pain Management, Manhattan Medicine, New York, NY, discusses stem cell therapy and platelet-rich plasma for precision pain management. WATCH VIDEO. This interview with Abraham Morgentaler, M.D., originally appeared in Harvard Health in 2007. However, it remains as relevant now as it was then, and addresses many of the same questions and concerns physicians still have today. AMMG Presents the 2018 Alan Mintz, M.D. Award to Mark Gordon, M.D. On Friday, November 2nd at the 25th Clinical Applications for Age Management Medicine Conference in Tucson, Arizona, AMMG presented the 12th Annual Alan P. Mintz, M.D. Award for Clinical Excellence in Age Management Medicine to Mark L. Gordon, M.D. AMMG has announced its first collaborative educational venture in Thailand, beginning with a medical education conference at Mae Fah Luang University on December 1 in conjunction with Singapore-based healthcare consulting and management firm DrMap. Diet And Age At Menopause: Is There A Connection? This retrospective study looks at the phenomenon of discontinuation of hormone replacement therapy (HRT), which is much more common than what is reported in randomized, double-blind clinical trials. The American College of Sports Medicine surveyed thousands of fitness professionals about health and fitness trends for the coming year. Researchers recently evaluated the use of a score that measures the impact growth hormone replacement therapy (GHRT) has on clinical factors associated with adult growth hormone deficiency (AGHD) and found the score was clinically different in patients who did not receive replacement therapy. In November 2017, the American College of Cardiology (ACC) and the American Heart Association (AHA) released a clinical practice guideline for the prevention, detection, evaluation, and treatment of high blood pressure (BP) in adults. This article summarizes the major recommendations. Experts say emerging tools could become as important to precision medicine as HTML is to the web. This e-Journal is the Official Publication of the Age Management Medicine Group (AMMG), and is provided to industry colleagues and friends free of charge. 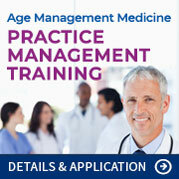 The E-Journal of Age Management Medicine, Greg Fillmore & Rick Merner, Co-Publishers. 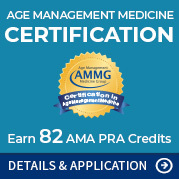 The Age Management Medicine Group (AMMG) is a division of Red River Solutions, Inc. with a goal of providing education and information on the new sub-specialty of Age Management Medicine to physicians and healthcare professionals through evidence based continuing medical education conferences, workshops, seminars and publications. Age Management Medicine is a proactive, preventative approach focused on preservation of optimum human function and quality of life making every effort to modulate the process of aging prior to the onset of degenerative aging. The basic tenets of Age Management Medicine are patient evaluation through extensive medical history, lifestyle assessment, physical examination and laboratory evaluation to establish personalized proactive treatment plans consisting of proper diet, exercise, stress management and appropriate medical interventions. Any comments, concerns or interest in publishing articles or advertising in this newsletter should be directed to Journal@AgeMed.org. Copyright 2018 AMMG. All rights reserved. This publication is protected by United States copyright and other intellectual property laws and may not be reproduced, rewritten, distributed, re-disseminated, transmitted, displayed, published or broadcast, directly or indirectly, in any medium without the prior written permission of AMMG. 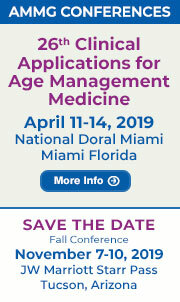 The Age Management Medicine Group (AMMG) provides evidence-based continuing medical education conferences, publications, web media and membership for healthcare professionals.